In this month’s Beeline we will be recapping our May 3rd PUB meeting. We met at our usual location at Rose City Park United Methodist Church – and will be again on Wednesday, June 7th from 7-9pm. 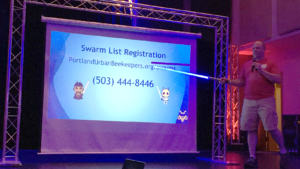 Dewey Caron shared information on swarms in May. He also shared an important link about the impact of pesticides on our bees. 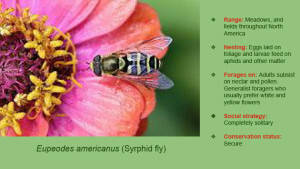 Go to http://pesticideimpacts.org for more information. Glen Andresen shared his monthly Pollen & Nectar report. We’re seeing annual flowers such as the Hybrid Poppy, and bulbs like the crocus bellflower (campanula), as well as the usual suspects like the sweet cherry and the asian pear starting to bud and flower. For a more detailed report check out bridgetownbees.com for Glen’s monthly “What’s in bloom” report. Send photos and suggestions of other good honey bee plants to glen@bridgetownbees.com. Swarm Traps! By setting out swarm traps we can make it easier to catch our own swarms and give swarming bees a place to move into instead of a neighbor’s wall or attic space. And there’s no better time to catch swarms than right now! For information on how to catch swarms and to download swarm trap plans check out PUB’s blog post here. If you don’t want to build your own bait hives, we still have a few still available for purchase for $30 ($25 for 2 or more) so contact Lauren Smith to order. Our May meeting featured Rebekah Golden, who gave a wonderful presentation about her experiences working with native bees. 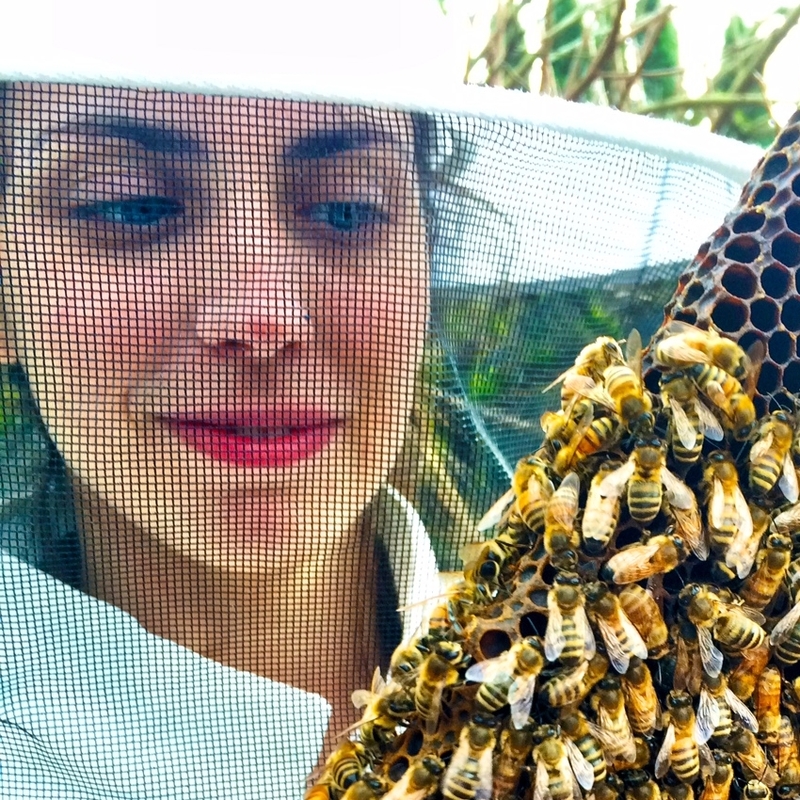 Rebekah loves talking about all types of pollinators and is the education coordinator over at Bee Thinking. She was nice enough to allow us to post it on our blog so head over and check it out. We are so grateful to Rebekah for taking the time to share with our group. Come check us out at the Multnomah County Fair May 27th – 29th starting at 12:00pm over at Oaks Amusement Park, 7805 SE Oaks Park Way, Portland, OR 97202, USA. Zenger Farm will be having an Epi-pen training class at the farm on Wednesday, July 14th from 10am-12pm. Cost is $30 per person. If you want to attend send an RSVP to andy@zengerfarm.org. And last but not least… don’t forget to SAVE THE DATE for Tour De Hives 2017 June 24-25! 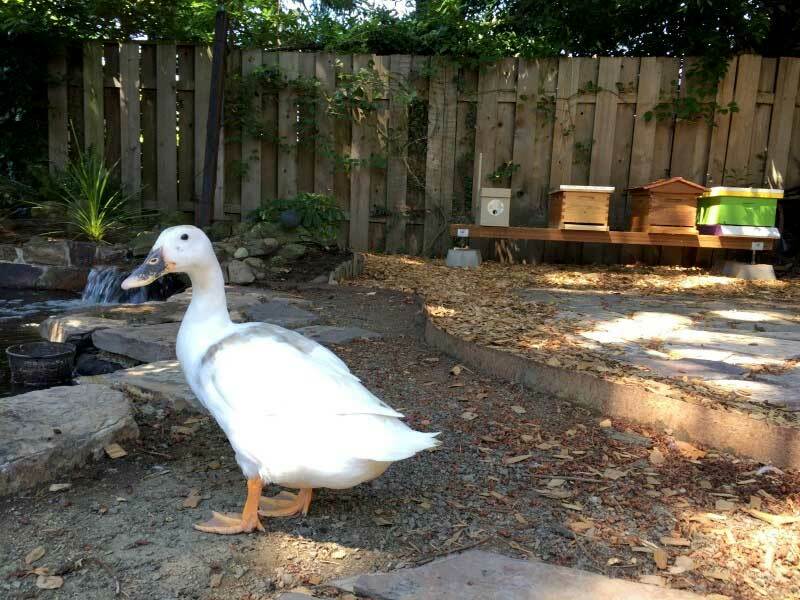 We will feature tour stops of backyard apiaries all over Portland. If you’d like to become a sponsor and be featured on this website, booklet, and poster please send send an email to events@portlandurbanbeekeepers.org. Tickets are going fast so head over to our website and pick up your own. In this month’s Beeline we will be recapping our February 1st PUB meeting. 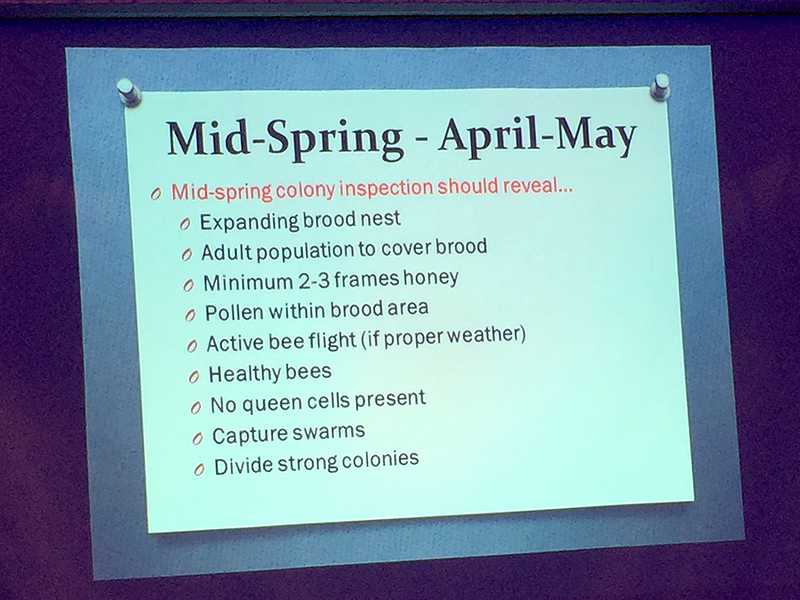 Once again, Bridgetown Bees‘ Glen Andresen shared his monthly Pollen & Nectar report with his extensive slideshow on current flowering plants. Even though we’re coming out of an atypically harsh winter, Glen provided some great information on the several blooming nectar and pollen plants just coming into bloom that are keeping our girls busy this February and March. You may want to look out your backyard and see what’s blooming there. For example, there are several variety of crocus that are just starting to bloom for our girls coming out of the darkness of winter. Also vine plants such as the winter jasmine and winter honeysuckle are beginning to bloom as well. For a more detailed report on current flowering plants check out Bridgetown Bees for Glen’s monthly “What’s in bloom” report. Click here to check it out. In addition, if you happen to run across any interesting honey bee plants during your outside times be sure to email Glen with any photos and/or suggestions. Our featured speaker this month was Susan Chernak McElroy, best-selling author, master storyteller and co-founder of Spirit Bee. 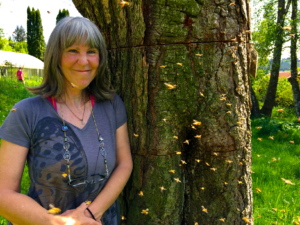 Susan’s hives are the focus of her spiritual practice—the apiary as temple, teacher, divine inspiration, and meditation corner. She continues to study the science and the mystery of beekeeping, and believes that what is truly good for honeybees is equally good for human bee-ings. If you haven’t checked out her New York Times Bestseller, ‘Animals as Teachers and Healers,’ you should. Click here for a link to her books. Susan’s writings are published in more than twenty languages worldwide. 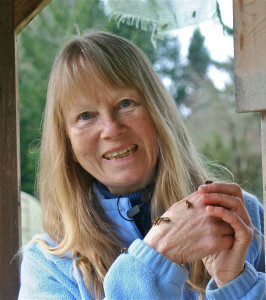 Many thanks to Susan for sharing her holistic view of what beekeeping is like for her. 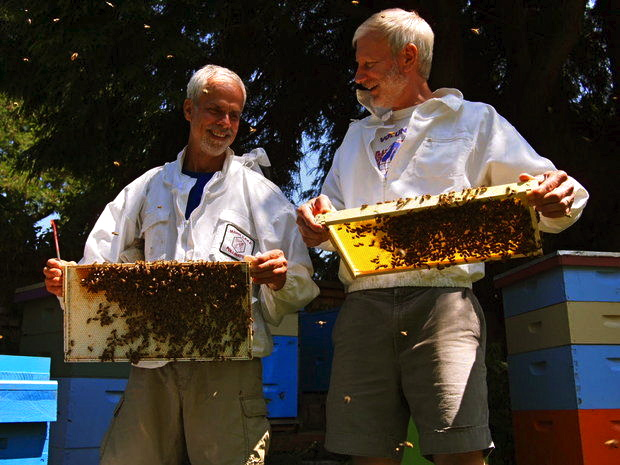 We’re excited to announce that Michael Thiele, founder of Gaia Bees will be speaking here in Portland on Saturday, March 18th. More details to come!! Bee School 2017 was a huge success as we had a record 42 attendees and 8 volunteers. For those not familiar, Bee School is a yearly event for beginning beekeepers and provides 6 hours of classroom instruction plus 2 hours of hands on experience inside a working hive. 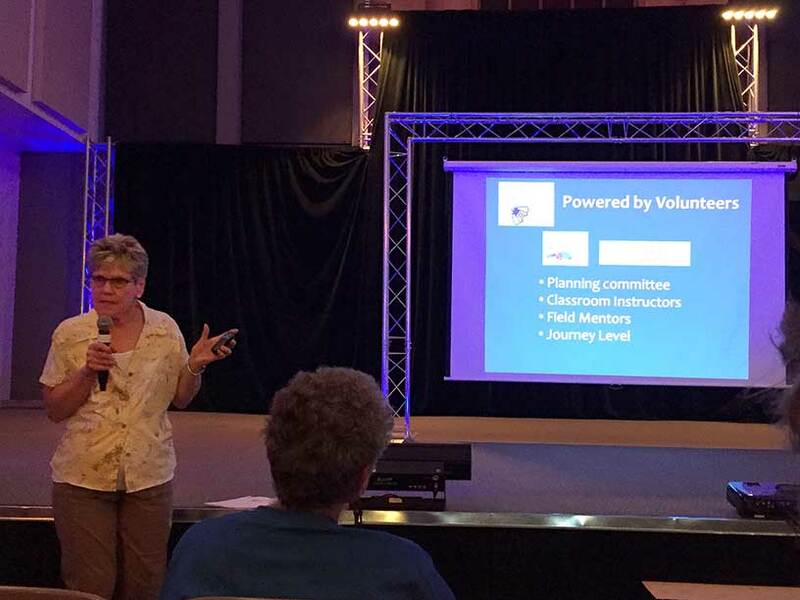 For those who attended, keep on the lookout for your field reminder which will be coming to you in the coming weeks. We have several opportunities for volunteering and being involved with the club. 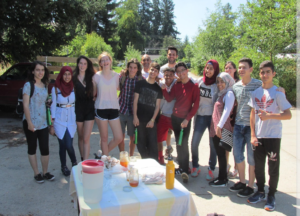 If you’d like to volunteer for Tour De Hives 2017, help out with Zenger Farm, help a board member, or become a mentor, please email Bill or talk to a board member at the next meeting. In this month’s Beeline we will be recapping our October 5th PUB meeting. Our next meeting on Wednesday, November 7th will be at our NEW LOCATION – Rose City Park United Methodist Church located at 5830 NE Alameda St. Click here for directions. DO NOT meet at Alberta Abbey. This coming Wednesday is our annual PUB Showcase! This will be an opportunity for all PUB members to show off your bee-related projects, plans, products, and employment. Whether you make a living, supplement your income, or just have fun with bees, you are invited to set up a table to show off what you enjoy doing. Spaces are free and tables will be provided. Please email us to reserve your table. Please show up at 6pm to set up your table. 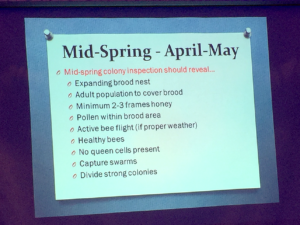 Once again, and in supreme style, Bridgetown Bees’ Glen Andresen shared his monthly Pollen & Nectar report with his extensive slideshow on current flowering plants. As he does each month, Glen provides information on the many blooming nectar and pollen plants still out there that are keeping our girls busy through November/December. For a more detailed report check out Bridgetown Bees for Glen’s monthly “What’s in bloom” report. If you run across any interesting honey bee plants be sure to email Glen with any photos and/or suggestions. Our featured speaker this month was Mark Johnson. 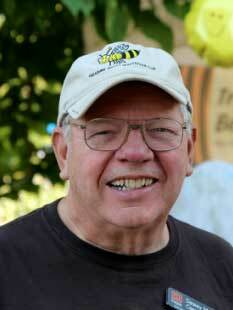 Mark is a former Vice President of OSBA and veteran of 44 years as a commercial beekeeper. Mark, who has over 1200 hives, provides pollination services to farmers starting with the California almond bloom in February, moving from crop to crop all spring and summer, until the time when he harvests honey in August. Honey harvesting is one of the more expense processes a beekeeper does and Mark shared which processes work best for him. “We do both pollination and honey, but honey is only about 20 percent. 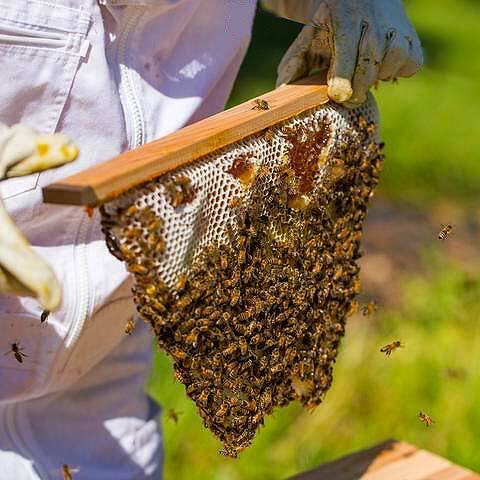 In western Oregon if you tried to keep bees for honey you’d go broke, it’s mainly renting hives to farmers.” Many thanks to Mark for sharing his big-picture view of what beekeeping is like for him, his family, and employees throughout the year. Congratulations go out to Michael Carlson and Lil Reitzel who won the OSBA conference giveaway. We hope to post their experiences of the conference to our PUB Blog and Facebook page in the coming weeks. Stay tuned! PUB Bee School is scheduled for Saturday, January 28th, 2017. If you or a friend have been wanting to take a beginning beekeeping course registration is now open. Click here for more info and to register. Honey Tasting event – Wednesday, December 7 . Location will be at Rose City Park United Methodist Church, 5830 NE Alameda St Portland, OR 97213, in the Youngson Hall (basement) meeting room. In this month’s Beeline we will be recapping our July 6th PUB meeting. Our next meeting is Wednesday, August 3rd at Alberta Abbey from 7-9pm. Hope to see you there! As always, a huge thanks goes out to Glen Andresen for sharing his monthly Pollen & Nectar report. Alas, as the end of blackberry season is upon us, we also see the end of the honey flow. But there are plenty of blooming nectar and pollen plants still out there that are keeping our girls busy through October/November. For example, Scabiosa (also called the pincushion flower) will keep flowing and blooming on through November. For a more detailed report check out Bridgetown Bees for Glen’s monthly “What’s in bloom” report. Also email Glen with any photos and/or suggestions of other good honey bee plants. 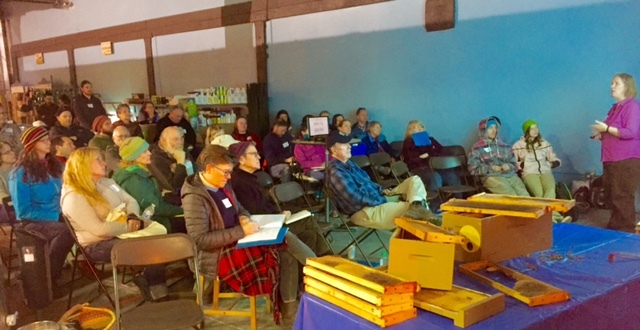 We heard once again from Dr. Dewey Caron as he shared this year’s results for the PNW Honey Bee Survey. He also shared best practices for mite control. This is something that all beekeepers must do to keep their hives healthy. 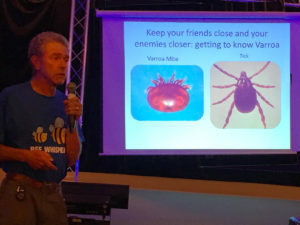 His presentation outlined three basic methods for monitoring mites which included the natural mite drop and the popular sugar shake method. 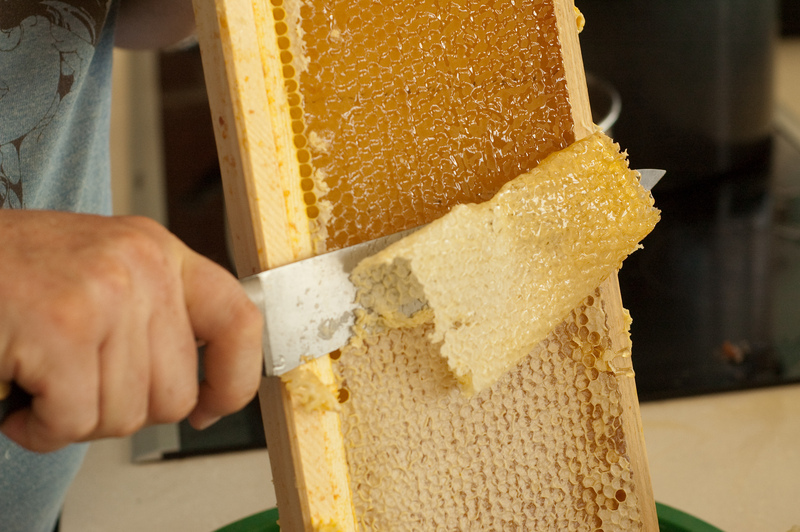 Click here to download a PDF and choose a method for your own hives. Again this is an essential step in maintaining your hives to give them the best chance to survive winter. 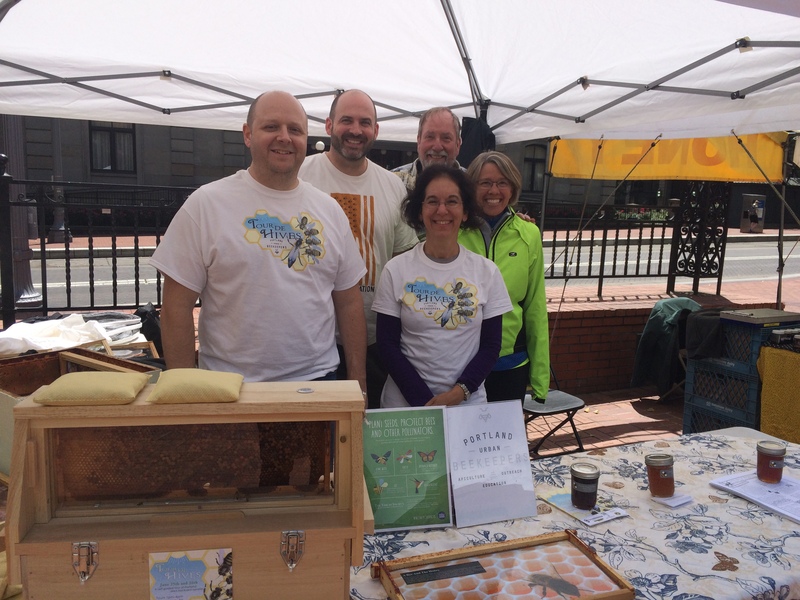 We also heard from Tim Wessels and Glen Andresen, co-owners of Bridgetown Bees. In addition to providing honey and beekeeping equipment at their brick-and-mortar store, the primary mission of Bridgetown Bees is to selectively breed and raise queen bees in the city of Portland that are suitable for year-round survival here and in other cities in the Pacific Northwest. Tim and Glen shared an informative presentation for their queen raising methods. If you have any questions for Tim or Glen on their methods give them a email at contactusbridgetownbees(at)gmail.com. 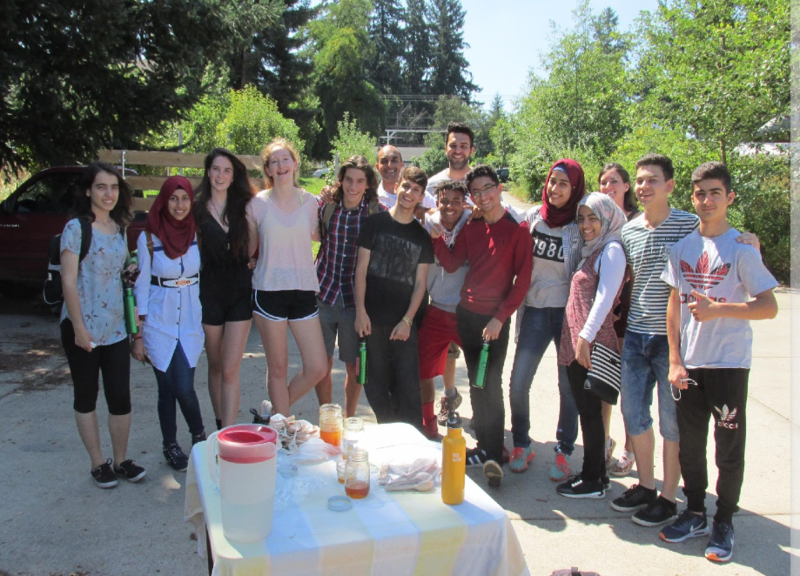 Tour De Hives 2016 was a smash success with our largest turnout yet! Thanks to all the volunteers, hosts and people behind the scenes that made it happen. Check out the Photo Gallery. Also if you haven’t filled out the Tour De Hives survey it would help us make next year’s event even better. It takes only 3 minutes. Thanks! This month we will be recapping our June PUB meeting. Our next meeting is Wednesday, July 6th at Alberta Abbey from 7-9pm. Hope to see you there! Rita Ostrofsky started things off with an overview of the Oregon Master Beekeepers program. 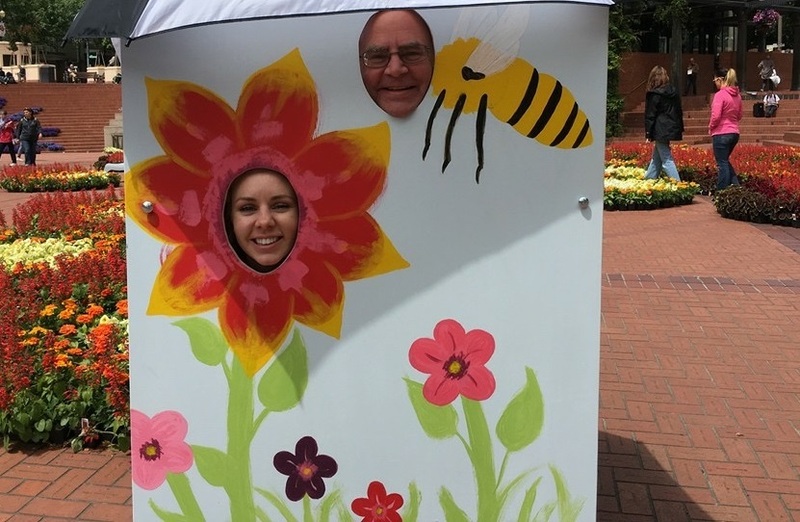 The OMB program is celebrating it’s 5th year and is a cooperative effort between Oregon State University and the Oregon State Beekeepers Association. 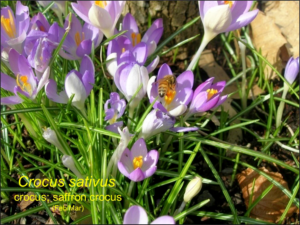 Glen Andresen shared his monthly Pollen & Nectar report. Glen took us through annuals, perennials, shrubs, vines and flowering trees that are contributing to this year’s record honey flow. For a more detailed report check out bridgetownbees.com for Glen’s monthly “What’s in bloom” report. And please email Glen with any photos and/or suggestions of other good honey bee plants. 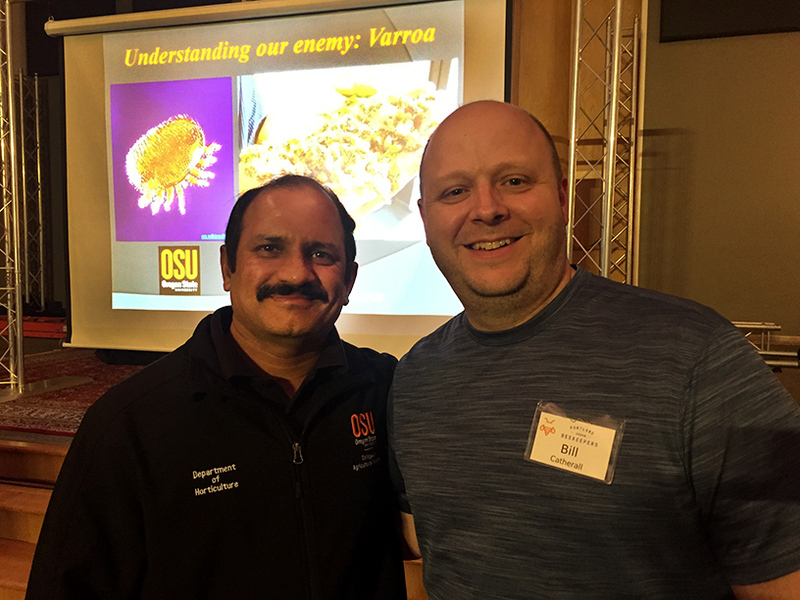 Our featured speaker was Washington State Master Beekeeper Morris Ostrofsky, who explored best practices for varroa mite control. Morris’ passion for teaching and beekeeping becomes apparent when he shares his knowledge with others. An interest in genetics and queen rearing has led to a quest to breed locally adapted, treatment free bees using the Miller Method. Below is his presentation. Tuesday’s PUB booth at Pioneer Courthouse Square had a great turnout of both PUB members and public visitors. The weather cooperated 90% of the time and lots of people were out and about during the lunch hour, stopping by and learning about bees and Tour de Hives. We’re less than 10 days from Tour De Hives 2016 which is the weekend of June 25-26! This is our yearly fundraiser and PUB’s best opportunity to introduce Portlanders to the art and science of beekeeping. Tickets now on sale here so please spread the word to all your friends. This month we will be recapping our May 4th PUB meeting. Our next meeting is Wednesday, June 1st at Alberta Abbey from 7-9pm. Hope to see you there! PUB President Bill Catherall started things off reminding those not on the Swarm List to register as this is the month for swarms. 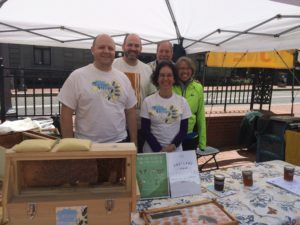 If you haven’t registered jump on over to the Bee Allies site and take advantage of swarm reports, mentoring opportunities, and available apiary spaces. 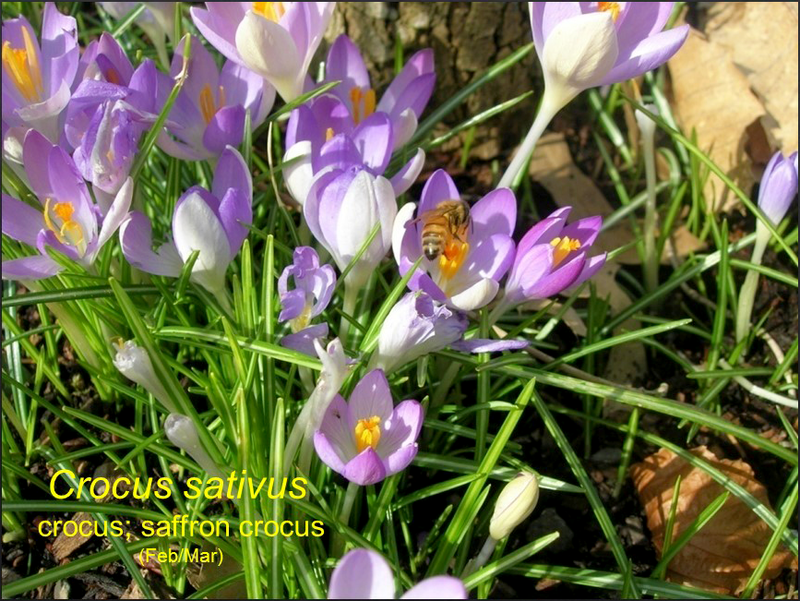 Glen Andresen shared his monthly Pollen & Nectar report. 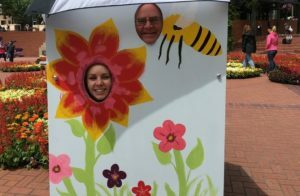 In addition to his advice on using mouse guards with your hives, Glen took us through annuals, perennials, shrubs, vines and flowering trees that are contributing to this year’s record honey flow. For a more detailed report check out bridgetownbees.com for Glen’s monthly “What’s in bloom” report. And please email Glen with any photos and/or suggestions of other good honey bee plants. Our featured speaker was Professor Dewey Caron, who explored best practices when caring for your hives during the month of May. To view the complete presentation go here. He also gave us a presentation on swarm control offering up many different solutions you can try out depending on your goals and how much work you want to put into it. Swarm season is underway and it’s not too late to get in on the action! If you need bait hives there are still a few available for purchase for $30 ($25 for 2 or more) so email Lauren Smith to order yours today. We’re just 6 weeks from Tour De Hives 2016 which is the weekend of June 25-26! This is our yearly fundraiser and PUB’s best opportunity to introduce Portlanders to the art and science of beekeeping. Tickets now on sale here so please spread the word to all your friends. In this month’s Beeline we will be recapping our April 6th PUB meeting. Our next meeting is Wednesday, May 4th at Alberta Abbey from 7-9pm. Hope to see you there! In lieu of our monthly member spotlight, Bill Catherall led an informative Q&A session called “What to do in the hive this month” that included strategies in swapping brood boxes and when to split your hives. Feel free to email Bill if you have any questions regarding his session. Glen Andresen shared his monthly Pollen & Nectar report. We are seeing the beginnings of a nice spring flow which is quite advanced for this time of year. Wisteria is blooming now as are fruit trees such as the sweet cherry, Asian pear and Greengage plum. Broccoli and kale are flowering which is great for those urban farmers. For a more detailed report check out bridgetownbees.com for Glen’s monthly “What’s in bloom” report. Please email Glen with any photos and/or suggestions of other good honey bee plants. Did you know that there are over 4,000 species of native bees in North America alone? 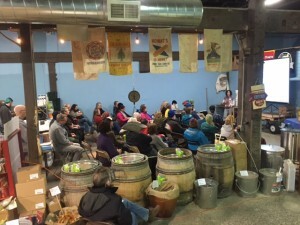 Our April meeting featured local entomologist Rebekah Golden, who gave a fantastic presentation about native pollinators. Thank you Rebekah for sharing with our group. If you have any questions about Rebekah’s presentation you can contact her here. Swarm season is underway and it’s not too late to get in on the action! If you need bait hives there are still a few available for purchase for $30 ($25 for 2 or more) so email Lauren Smith to order yours. And last but not least… don’t forget to SPREAD THE WORD for Tour De Hives 2016 which is the weekend of June 25-26! This is our yearly fundraiser and PUB’s opportunity to introduce Portlanders to the art and science of beekeeping. There are still opportunities to volunteer or host your hive so if you are interested follow this link to the official volunteer/host application. In this month’s Beeline we will be recapping our March 2nd PUB meeting. We met at our usual location at Alberta Abbey – and will be again on Wednesday, April 6th from 7-9pm. In lieu of our monthly member spotlight, Bill Catherall led an interesting 20-minute Q&A on all things bee-related. Glen Andresen shared his monthly Pollen & Nectar report. With perennial additions such as the hellobores, and bulbs like the crocus tommasinianus, we’re also seeing a lot of the usual suspects like the sweet cherry and the asian pear starting to bud and flower. For a more detailed report check out bridgetownbees.com for Glen’s monthly “What’s in bloom” report. Send photos and suggestions of other good honey bee plants to glen@bridgetownbees.com. 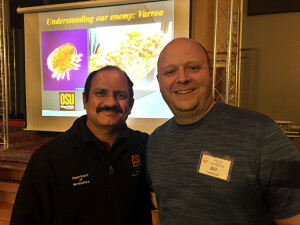 Bill Catherall shared an informative presentation on Swarm Traps and best practices on design, placement and baiting. 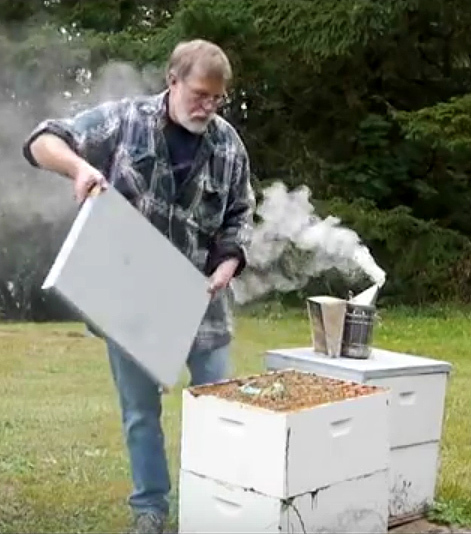 By setting out swarm traps we can make it easier to catch our own swarms and give swarming bees a place to move into instead of a neighbor’s wall or attic space. For more information on his presentation and to download swarm trap plans go to Bill’s blog post here. 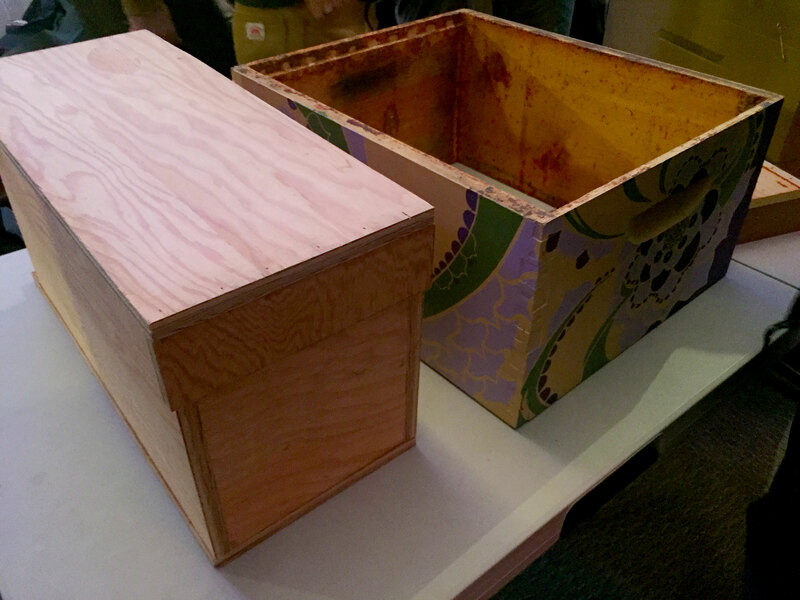 Also there are a few bait hives still available for purchase for $30 ($25 for 2 or more) so contact Lauren Smith at librarian@portlandurbanbeekeepers.org to order. 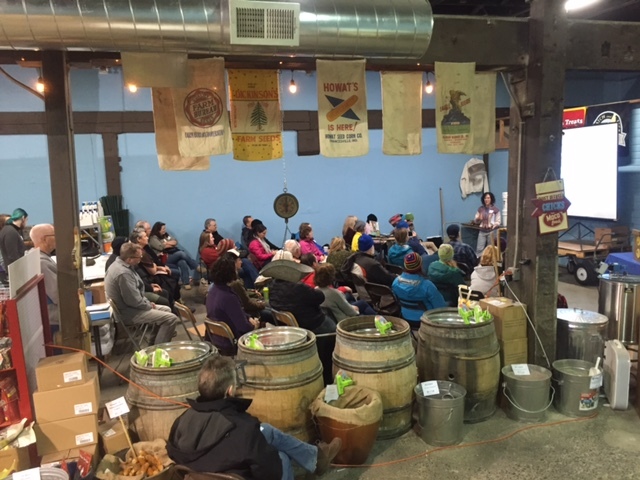 Our March meeting featured Jacqueline Freeman, who gave a dynamic presentation about her experiences working with warre and top bar hives. 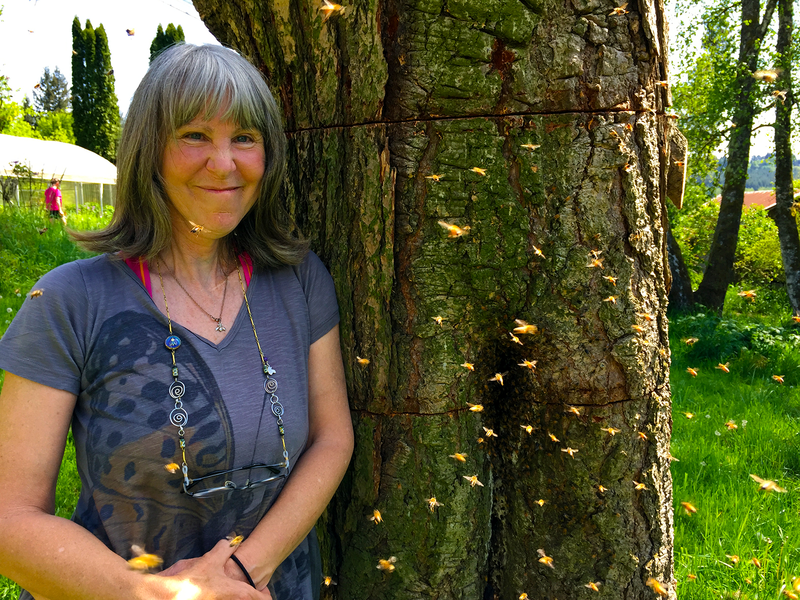 Jacqueline is committed to a more relational and non-intrusive way of working with her bees to create treatment-free health and contentment in the hives. 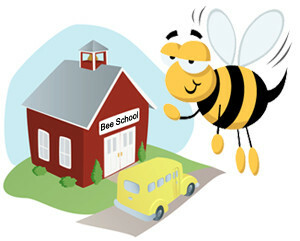 For more information about Jackie’s classes go to http://spiritbee.com/classes/. We are so grateful to Jackie for taking the time to share with our group. And last but not least… don’t forget to SAVE THE DATE for Tour De Hives 2016 June 25-26! 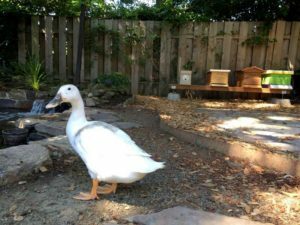 We will feature tour stops of backyard apiaries all over Portland. 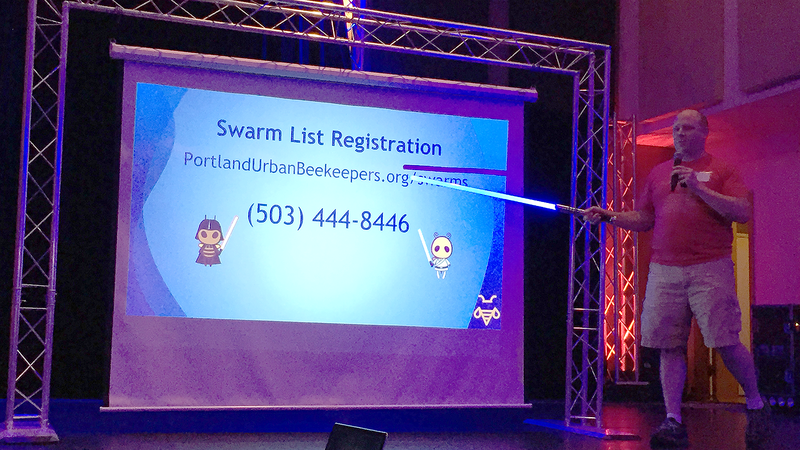 If you’d like to become a sponsor and be featured on this website, booklet, poster and even t-shirts, please send send an email to events@portlandurbanbeekeepers.org.